I’m walking up the steady incline of 122nd Street, shadowed by the heavy spires of Riverside Church, self-consciously leered at by three ancient gargoyles perched high up and covered in snow. My first semester at Union Theological Seminary in New York is drawing to a close, and, as I have throughout my first few months living here, I’m walking aimlessly in search of some new sight. This is my way of escape for a few brief moments, even if just for a quick walk around the block, to clear my head from the sometimes suffocating side of graduate school life. Today is the coldest since I’ve been here and a pale gray hangs over everything. It's a less than subtle reminder of the liturgical season that the church currently finds itself in the midst of — Advent. It has taken a long time for Advent to really mean anything to me. For years, I sped through the weeks leading up to Christmas with only half-hearted thoughts about the infant Jesus, college final exams, angels, wise men, gifts to buy, flocks tended by night — that kind of thing. Christmas day was a time of glory and joyousness, hope and tranquility. Advent was little more than a distraction before the main show, a candle lit and another sermon about waiting and dreaming. It has only been recently, and for the most part unknowingly, that this dreaming, this hoping, this waiting has come to mean something for me, that I’ve realized that this is what the Christ-event is all about. In the lead up to all of our nativity pageants, our candle light Christmas eve services, our joy at the birth of this child, Advent stands to remind us that Jesus was not born into a world where he was welcome. There were those awaiting a messiah, yes, but there were countless more Herods and structures of Empire more than willing to kill for the sake of power, for the sake of safety, for the sake of continuity. The significance of the birth that we celebrate is that its message directly conflicts with that of the status quo. 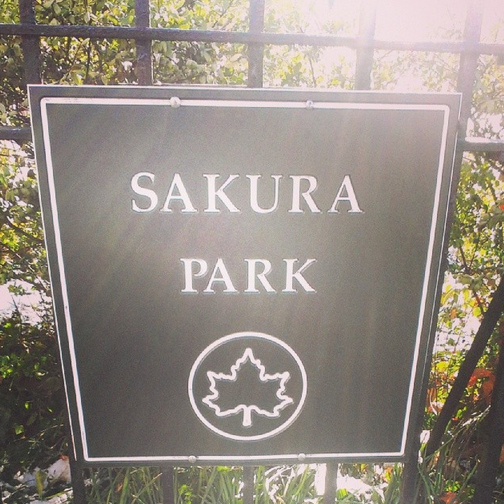 As I near the top of the hill, I slide carefully over a few icy cobblestones into Sakura Park. The cherry blossoms that draw so many tourists to this little patch of green in warmer months have all shriveled and fallen away, large chunks of slushy snow drop and burst in white clouds from the tomb of Ulysses S. Grant just across the street. I come upon a small snowman, half-melted, covered in dirt, and a man standing admiring it. We pause there together for a few minutes silently and watch this figure disappear before us. “That’s life, isn’t it?” he says, laughs, and continues on with his day. As one twig arm falls to the ground and this snowman begins to lean further to one side, I make the descent back to Union. I walk slow and pay attention to each foggy breath that I release. The cold repose of Sakura Park and the silent vigil stood melting by that lonely figure vanish from my view as I enter back into the hectic world of New York City, its joy and its struggles. I’m ready to open myself to what may come, to do what I can to bring comfort, healing and presence to a world that is rough and broken, alone and disappearing. I’m opening myself to welcoming those whose experience has been wrought by systemic injustice that dehumanizes and violence that tears down. As Christians, we are not called only to wait and to listen. We are called, implored by these weeks leading up to Christmas, to transform and to create a world of justice anew. Who are you welcoming this Advent season? Where are we finding our hope, in the comfort of the familiar today or the holy mystery of tomorrow? What are we waiting for, the cold and dark of the current moment or the bright light of new creativity?